Scientists discover genetic response to ocean acidification. Scientists have discovered that stunted growth can be a genetic response to ocean acidification, enabling some sea creatures to survive high carbon dioxide levels, both in the future and during past mass extinctions. Using natural CO2 seeps as test sites, the international team of marine scientists and palaeontologists have studied the way in which sea snails cope in more acidic conditions ‒ simulating the change in seawater chemistry that will occur in future as more atmospheric CO2 is absorbed by the ocean. The researchers say their findings, published in Nature Climate Change, provide an explanation as to why marine species that survived previous mass extinction events were much smaller – a phenomenon known as the ‘Lilliput effect’. 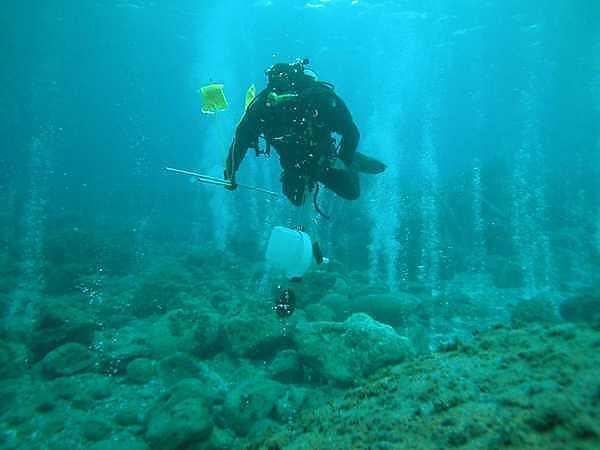 The research was funded by the EU MedSeA project and the UK Ocean Acidification Research Programme, and involved researchers from 10 institutions including Plymouth University, the University of Southampton, the Natural History Museum, London, and colleagues in Italy, Monaco, Norway and New Caledonia. Its results provide a stark warning about the impact that continuing ocean acidification could have on marine ecosystems unless we drastically slow the rate of carbon dioxide emissions. “Organisms that have been exposed to elevated CO2 levels over multiple generations provide valuable insights both into changes we can expect in marine ecosystems as CO2 emissions continue to rise unchecked, and into past mass extinctions." added Professor Marco Milazzo at Palermo University. Measurements showed that the shells from high CO2 seawater were about a third smaller than those in “normal” environments. Some of the snails were taken to the Marine Environmental Studies Laboratory at the International Atomic Energy Agency in Monaco, where their calcification rates were measured in aquaria. The results – published in the paper Physiological advantages of dwarfing in surviving extinctions in high CO2 oceans – confirmed the theory that the snails had adapted to the conditions over many generations. “The fossil record shows us that mass extinctions and dwarfing of marine shelled species are repeatedly associated with episodes of past global warming. It is likely that similar changes will increasingly affect modern marine ecosystems, especially as the current rate of ocean acidification and warming is so rapid."